Make your patio the highlight of everyone's summer with the Park Terrace Collection. Featured in a Textured Black Weave and accented with Salt and Pepper coloured cushions, this versatile sectional set is perfect for all of your summer entertaining. 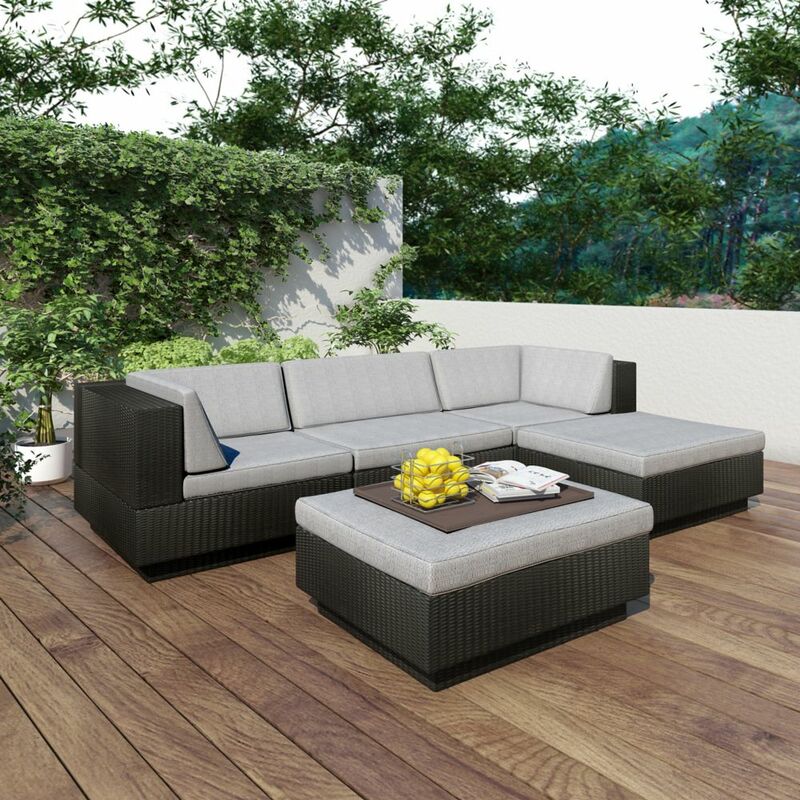 Made with UV resistant resin rattan wicker, water repellent cushions and a durable steel frame, each part of this set is as stylish as it is durable. Arrange it to suit your needs by transforming the cozy ottoman into a modern coffee table instantly! Summer is short; make sure you make the most of it with a cozy conversation area to share with friends and family in your backyard. This LABRIZA 7pc Round Sectional Set is an ideal way to bring your loved ones together and celebrate the warm weather. With its deep cushions and stylish design, this set will be a delight for entertaining or just relaxing with a good book. Set includes 4 chairs with toss cushions, 1 ottoman with cushion and two side tables. Get outside and enjoy the summer sunshine with the Patioflare Emmett Deep Seating Sectional Set. With heavy duty reinforced seats and deep seating, the durability and comfort of this sofa set are top notch. The tan coloured cushions are all made with water-resistant polyspun fabric, complementing the handwoven half-round brown wicker. Robust galvanized powder coated steel provides a strong frame and the tempered glass top of the coffee table makes this the perfect set for entertaining or simply lounging in your backyard. Set includes 1 left arm section, 1 right arm section, 1 table, and cushions. Park Terrace 5-Piece Double Armrest Patio Sectional Set in Textured Black Make your patio the highlight of everyone's summer with the Park Terrace Collection. Featured in a Textured Black Weave and accented with Salt and Pepper coloured cushions, this versatile sectional set is perfect for all of your summer entertaining. Made with UV resistant resin rattan wicker, water repellent cushions and a durable steel frame, each part of this set is as stylish as it is durable. Arrange it to suit your needs by transforming the cozy ottoman into a modern coffee table instantly! Park Terrace 5-Piece Double Armrest Patio Sectional Set in Textured Black is rated 3.0 out of 5 by 1. Rated 3 out of 5 by Jimbo from Medium Quality. Starting to Rust in First Season Pretty much what you see is what you get. I was hoping for a cover based on the cost $2,500. That said my only complaints are the minor frame bend (unsure what happened, it was perfect when I set it up) and I've seen minor rust on the patio stones below the chair.